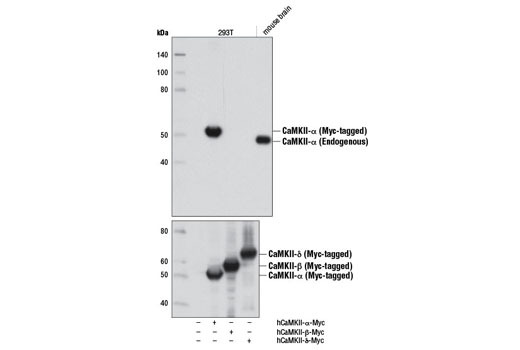 Western blot analysis of extracts from 293T cells, mock transfected (-) or transfected with a construct expressing Myc-tagged full-length human CaMKII-α (hCaMKII-α-Myc;+), CaMKII-β (hCaMKII-β-Myc;+), or CaMKII-δ (hCaMKII-δ-Myc;+), and mouse brain using CaMKII-α (D10C11) Rabbit mAb (upper) or Myc-Tag (71D10) Rabbit mAb #2278 (lower). CaMKII-α (D10C11) Rabbit mAb recognizes endogenous levels of total CaMKII-α protein. The peptide sequence used as the antigen is not conserved in CaMKII-β, -γ, and -δ. Monoclonal antibody is produced by immunizing animals with a synthetic peptide corresponding to residues near the carboxy terminus of human CaMKII-α protein.